RSVPMaker now includes visual editors that simplify the setup of a calendar listing and the RSVP form for individual events. This should make a lot of RSVPMaker setup easier for people who don’t like to mess with code. Frankly, it’s also easier for me because I kept forgetting some of the shortcode options. When editing any page or post, you should see a new calendar button has appeared in the WordPress visual editor. Clicking that button will give you a popup editor for setting the parameters for an events listing, including whether the calendar should be displayed at the top of the listing. Most site owners will tweak one or two of these fields and leave the rest at their default values. However, it is possible to create a listing targeted to a specific post type (just the events tagged as webinars, for example). One other special case is inserting a single post. For example, you create a blog post advertising an upcoming event and want to embed the related RSVPMaker post inside that blog post, so people can click on RSVP Now and be taken straight to the signup form. 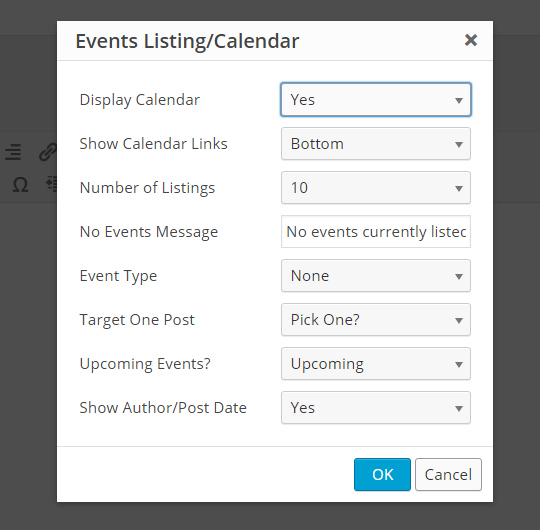 In that case, you would toggle off the display of the calendar and select that one event from “Target One Post” (not to self: change the label to “Target One Event”). When you insert the event, it’s now displayed as a placeholder image (switch the editor from Visual to Text mode if you want to see the underlying shortcode coding). You can double-click on the placeholder image to open up the editor and make changes. Up until now, altering the RSVP Form has required working with a mix of HTML and shortcodes, which are documented here. I’ve added a popup code generators that addresses a bunch of common tweaks you might want to make, like deciding whether or not to ask for a phone number, adding an additional text field or two, and deciding whether or not to include the “guest” fields. You can use the form generator and still tweak the HTML or add additional fields as necessary. This is a simple form generator and does not cover all the shortcodes for adding things like radio buttons. 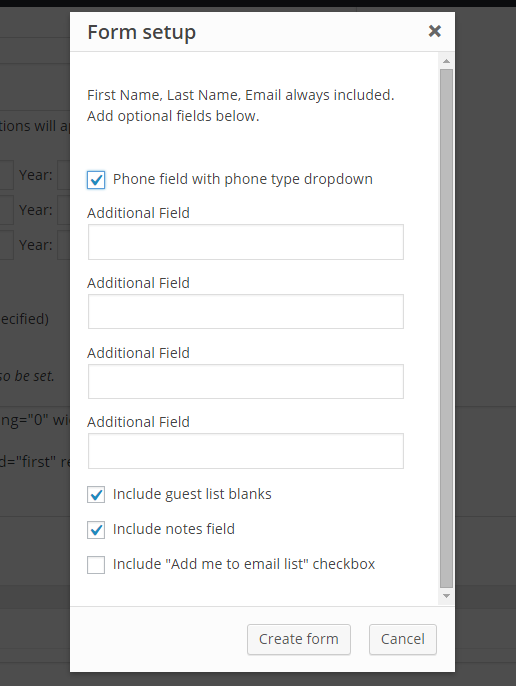 If you use this in combination with my Chimpblast plugin for MailChimp, and include the “Add me to your email list” checkbox on your form, the software will attempt to subscribe the event attendee to the default mailing list you have specified in Chimpblast. (Okay, almost nobody other than me uses Chimpblast, but this was a handy feature for me to add and one someone else might find useful).